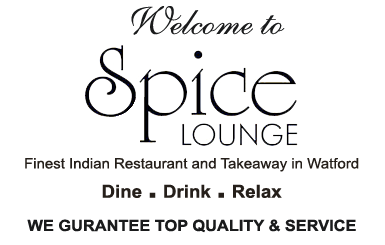 We welcome you into our Spice Lounge restaurant at Watford where you can enjoy the relaxed and comfortable surroundings tempted by an unrivaled range of authentic dishes. All the dishes we have in this menu are made to order, so some dishes will take more times than others, Please enquire if necessary. 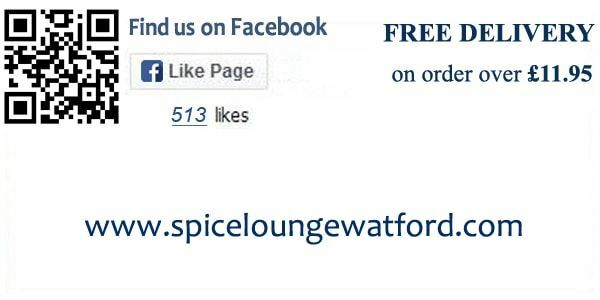 Please ask for any dished not on the menu, we will endeavour to serve you. Enjoy your meal and have a memorable dining experience. If you have an allergy that could harm your health we strongly advise you to contact the restaurant directly before you place your order or leave your notes on Message box in Checkout.